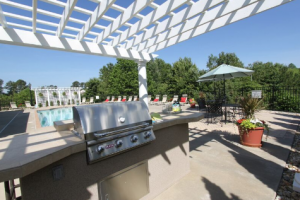 Outdoor Living is Hot at Cornerstone Homes! Make your outdoor spaces into true living spaces with comfortable furniture, rugs, cushions, pillows, and built-in planters or benches. Turn a corner of your patio into a full-functioning outdoor kitchen, complete with outdoor grill, appliances, prep counter, cabinets and bar. Carry the colors/materials from inside the house into your outdoor rooms. Choose bolder versions of your color palette and textiles so they stand up to the vast expanse of nature. Nothing beats the soothing sounds of a fountain, pond or waterfall. Add water plants and fish and you’ve got the perfect retreat. Surround your space with pots or planting beds, so you can enjoy being close to the flowers, veggies, fruits and herbs.